Collaborators: BUST Magazine, Modern Farmer, Green Mountain Energy, Alimentary Kitchen, Jean Deaux, Like Minded Objects, Swoon Kitchen Bar, Kite’s Nest, CCCA (Columbia County Council of the Arts) and Columbia County Chamber of Commerce. Buy Vintage, Local, Handmade… | Nothing boxed. Nothing pre-packaged in plastic wrap. Nothing with a bar code. With more than 80 vendors and 3,500 attendees, Basilica Farm & Flea, in collaboration with BUST Craftacular, was a wildly successful Thanksgiving weekend marketplace showcasing quality products presented by regional makers, farmers, and vintage collectors. With such an incredible response, it was clear that there is a passionate and productive desire to celebrate and inspire the best of what the Hudson Valley has to offer: farms, food, and most of all a strong and creative community. Farm & Flea kicked off with a Black Friday Soirée as a counterpoint to the consumerist trend of Black Friday big box shopping rage. 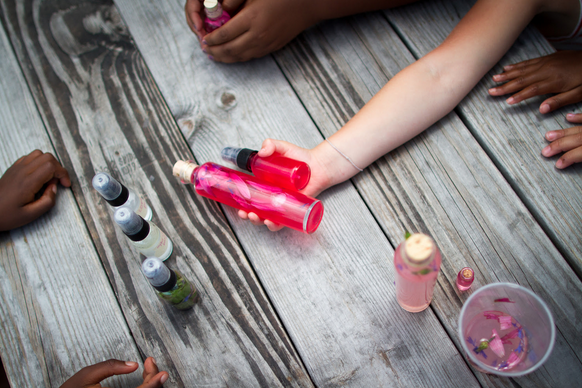 Guests shopped offerings included handcrafted products like artisan jewelry and furniture, locally sourced herbal remedies, and meats and poultry from area farms while partaking in a lively festival atmosphere of bustling connection and energy. An Extraordinary Environment for Children to Work, Play & Grow | Basilica is proud and pleased to be hosting Kite’s Nest, a new place dedicated to curiosity and inquiry in our Gallery Building, for their second year.Young creative minds are being engaged and encouraged in hands-on journeys – whether it be cooking in the warmth of the Kite’s Nest kitchen, exploring the wild woods around them, making sunprints, or telling stories on WGXC community radio. 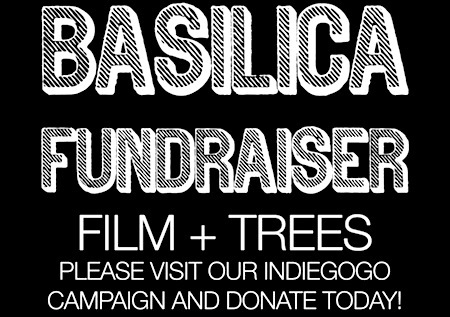 THANK YOU – Film & Tree Fundraiser | Basilica Hudson joined forces with local landscape designer Wenonah Webster and Pond Side Nursery to hatch a long term plan to bring trees to our landscape. With big dreams, for a big factory (in a little city!) we drew on amazing community support to raise money for the cinema upgrade and planted 10 maple trees on the South Front Street corner of our lot. THANK YOU to all who supported this endeavor. We will continue in our aim to give back by expanding the scope of our film program and bring more greenery to Hudson’s waterfront. Special thanks to CCCA for their support with the fundraiser. Spring Delicacy, Wild Onion | Abundant in the Hudson Valley, chefs and diners alike swoon at these pungent wild spring onions. Ramp Fest, now entering its 4th year, invited chefs from upstate New York and the big city to craft dishes around this popular forageable green. The competition was friendly and real – with Jeffrey Gimmel, co-owner and chef of Swoon and founder of the Ramp Fest bringing together a high caliber of participating chefs who yielded excellent and creative dishes for the crowd. Representing Hudson, Fish & Game offered up their twist on picklebacks (shots of rye whiskey followed by ramp pickle juice and cured ham on home-baked bread) while Crimson Sparrow created an exquisite and umami-laden mushroom and ramp salsa. Coming back by popular demand, May 2014! Community Action & Celebration | We were also proud to host and support the Hudson Sloop Club, the Buy Local Chamber of Commerce Expo , Guy McPherson’s educational lecture of “Durable Living for the 21st Century” and fundraisers for our local Habitat for Humanity, Fairview Cinema 3, and the Hudson Opera House, that celebrated 20 years as one of Hudson’s most longstanding arts organizations. We look forward to bringing all this and more next year. Stay tuned for our happenings as we warm up and enter Season 4 this Spring 2014!